One of the youngest and most talented players from the United States, Ray Robson has emerged as a beast among the chess world. He was the youngest American to get the Grandmaster title, breaking Fabiano Caruana’s record by only 4 days! Now that he is a member of the prestigious Webster University chess team and it’s SPICE program ran by Susan Polgar. Surrounded by top players, Robson is sure to continue absorbing information and increasing his skills even more. Ray Robson was born in Guam but moved to Florida at a young age. He learned how to play chess from his father when he was only 3 years old and quickly had success in Florida. After outgrowing his home state, Robson continued to test himself against stronger competition nationwide. He won seven national scholastic titles as a youth and has played in the World Youth Championships multiple years. In addition to this tournament, he tied for first place in both the 2005 and 2006 Pan American Youth Championships. This first victory resulted in him becoming a FIDE Master. Robson first became a USCF National Master in January 2006. He had good performances in large U.S. tournaments in 2006 and this qualified him for the 2007 U.S. Championship. At this time he was the youngest ever to play in the championship. A year later, in 2008, he earned his three International Master norms in only six weeks. 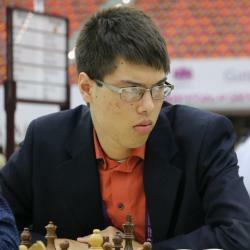 This allowed him to break Hikaru Nakamura’s record for the youngest U.S. International Master by one month. He earned his Grandmaster title in 2010 after winning his three norms in 2009. In August 2012, Robson began to go to Webster University. This school is well known for having one of the top chess programs and teams in the entire country. Robson is part of the SPICE program which was started by Susan Polgar. Robson has recently gotten his highest FIDE rating of 2667 which puts him ranked number 6 in all of the U.S. though and he will be sure to challenge for the number one spot in the very near future.